My last day of work in Brisbane Australia ended on 31 March 2008. We moved out of our apartment on 28 March to a motel just across the road until our flight back to Singapore on the 4 April. The magpies, butcher birds and Princess Mononoke had their last fed on that morning of 28 March and were told their goodbyes and they need to forage for their meals on their own. The possums had been given their last meal and goodbyes on the night of 27 March. We met and said our goodbyes to Tara/Tiki and Lisa of Goldcoast Tinkerbell and their SOs when we saw them at the Queensland State Bird fair at the Brisbane RNA ground on the 30 March. Ever since leaving Shama Yingshiong with the Jurong Bird Park on 7 May 2007, I thought of him very often. Though I wanted very much to find out how he was getting on, there was this fear in me of bad news such that I had not the courage to find out more of Yingshiong. It was only until the 9 April that I gathered my courage to go to the Jurong Bird Park to find out how YS was doing and if he was still alive. When we were at JBP on that morning of 9 April, I asked the staff at the entrance if they know of shama Yingshiong not expecting any answers as JBP have so many birds and not likely to know the fate of any individual bird especially so small a bird like a shama even if he meant so much to me. It was such a nice surprise when I was told 'Yes! 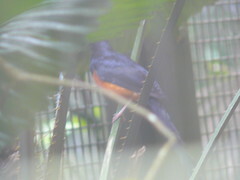 Shama Yingshiong is in the South East Asian Aviary'. My wife and I were delighted to hear that answer. I knew that day was going to be a very beautiful day. Should we be told he was not there, we probably would have walked out of the JBP there and then. The SEA Aviary was in the middle of JBP with many other aviaries between us at the entrance. Knowing that he was there, we were going to enjoy the rest of the beautiful JBP rather than just going to see YS directly. If any of you plan on visiting JBP, you should allocate an entire day there. I can guarantee you will be delighted with your day there. Eventually we reached the SEA Aviary. Thats when I became a bit nervous not knowing just what to expect. The SEA aviary consist of a huge central walk in aviary with smaller aviaries surrounding that central aviary. 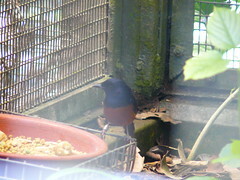 We moved counter clockwise and saw a shama in the first smaller aviary on a perch near us. In my excitement, I thought him to be Yingshiong. I called out 'Yingshiong' and he did not respond at all. I was disappointed that he forgotten me. Then I noticed his tail was rather short. And that perhaps he was not Yingshiong after all. We then walked on looking into other of the perimeter aviaries one after another. Those birds were gorgeous, but their beauty was lost on me. I would have enjoyed them very much at other times, but my heart was set on finding my Yingshiong. One by one we walked by. It was until near the end that I saw a shama on a food tray at the extreme far side of us pecking at the food. After the earlier disappointment, I was not sure if he was Yingshiong even if he looked like him. One shama looked very much the same as another especially from far. I called out 'Yingshiong! Come come come'. To my delight, at the sound of shiong, he abruptly flew from that tray. He did not fly to me. Instead he flew parallel to my side to the other far end and back again to that dish and looked at me. I called again Yingshiong!. He responded immediately again flying yet again parallel to my side to that far end and back to that dish. He stayed there and looked at me. I called 'come come come'. He flew around that aviary weaving in between the foliage and landing back on that dish. There was no mistake that was my little wonderful Yingshiong. If you recalled, whenever I went back to see him after a long absence, he always gave me cold shoulder on that day and would only come to me on the next day. My wife was delighted and called his name to be ignored by him. Whenever I called his name, he would fly paralled to me on his far side of the aviary. I could not get to that far side but I could go to the other side. So I went to the other side so that at least if he flew as before, he would be near to me. To my intense frustration, he then flew paralled to me when I was on that other side. Like he was playing a game with me. He was in the perimeter aviary with the Rothchild peacock pheasants and Lesser green broadbills. After some time, I decided to walk out of that SEA aviary to give him some time before seeing him again. My wife remained there with him. When I got back later, my wife told me that with me gone, Yingshiong had responded to her the way he responded to me. He would fly always parallel to her on that farside whenever she called his name. He did not respond to her calls when I was there. I then spoke nice things to him. To no good effect. Whenever I called his name, he would zoom to and fro, on that farside whichever side I walked to call him from. And with that occasional complete twisty circuit around his aviary. I was ecstatic even if he did not come to me. He showed, in his own way, he remembered us very clearly. I regreted my earlier cowardice in not daring to go to see him. If I had, perhaps he would fly to me the next day when I went to see him again. There was this very clear difference in behaviour with that first shama bird I encountered in that SEA aviary. Many shamas are bred birds and that first shama perched near the path where people walked by. Yingshiong was a wild caught. YS quickly reverted to his wild heritage in remaining far from people and near hiding areas. I was lucky that I had the fortune to have Yingshiong for a while with me. To know and gain the trust and to live together for that little while. Now that I know he was well, I have final closure with that little creature that is Yingshiong. We both stayed on to late afternoon watching him, and talking to him and with him watching us. From time to time, he would , when I called his name, do a complete circuit of his aviary and flew off to hide in the foliage. Then when I remained silent, he would pop out again to perch in sight to look at me yet again. Then at his name being called by me, he would do another to and fro , always at the far side. We had to go as I had another round of drinks and dinner with my human friends in Singapore. Which got me back so late and so slushed that I was not able to write of that last night. Photos taken by my wife of that visit to Yingshiong are in the folder "Yingshiong at Jurong Bird Park 4-08 "
Right now, I am writing all this to you from that Internet cafe in Taipei near my hotel near Sungshan station. Yes! I am back in Taiwan again having flown here on 10 April. Which was why I was not able to see Yingshiong again the next day. The feeling I have now in this Internet cafe is a much happier feeling than that last time when I was here in early January this year when I had to write that bitter report of lost Tinkerbell at Bantienyen. We will be taking that High Speed train from Taipei to Chiayi on the morning of 12 April. Where I will see Tinkerbell and friends of Chiayi. We should be in Chiayi for about 10 days. Then me and my wife will continue to Taroko Gorge, which we cancelled in my last trip for reasons you all know of. We will fly back to Singpore at end of April and on to the next chapter.